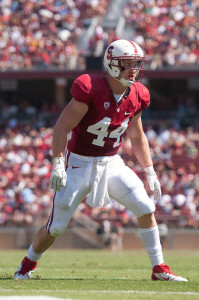 After an action-packed offseason that saw the Cardinal land the best recruiting class in school history, hire veteran coaches in special teams coordinator Pete Alamar and inside linebacker coach David Kotulski and fill preseason watch lists for national awards with a horde of its own players, Stanford football is finally ready to hit the field in tonight’s 7-p.m. season opener against San Jose State. On the heels of two remarkable seasons that included back-to-back BCS bowl berths, the Cardinal will have some new faces on both sides of the ball this year. Among them is redshirt junior quarterback Josh Nunes, preparing to take the reins of the offense in his first collegiate start. Nunes beat out redshirt sophomore Brett Nottingham for the starting job in what was perhaps the biggest story of preseason camp. Nunes faces a tall order in replacing his near-perfect predecessor, Andrew Luck, but head coach David Shaw has shown a great sense of confidence in his new starter thus far. Following the advice of Luck, who sent a congratulatory text to Nunes saying, “Now it’s time to work,” the new quarterback has been covering all the bases in his mental preparation. Studying game film is a huge component for Nunes, who has been watching extra film outside of practices and meetings when he wakes up every morning and before he goes to sleep every night. Nunes should also be getting plenty of help in his first game from senior captain running back Stepfan Taylor, who has emerged as one of the top halfbacks not only in the Pac-12, but also in the nation. With backs Jeremy Stewart and Tyler Gaffney gone, the bulk of the carries will fall on Taylor’s shoulders as he steps in as the leader of the Cardinal’s run-first offense. The veteran tailback is pursuing his third consecutive 1,000-yard season. The all-time Stanford rushing record is also in sight for Taylor—he needs 1,264 more yards to overtake Darrin Nelson’s mark—but the senior captain has been brushing off the record talks. The San Jose State defense may not boast nationally recognized players, but it does showcase defensive end Travis Johnson, last season’s Western Athletic Conference defensive player of year. Johnson recorded 9.5 sacks last year and threatens to wreak havoc in the backfield should the Cardinal offensive line—which graduated two top draft picks—neglect to contain him. Friday’s game will consist of a matchup between two new quarterbacks, as the Spartans also feature a rookie passer in David Fales. Before transferring to San Jose State, Fales spent two seasons at Monterey Peninsula College, where he threw for 4,635 yards and 37 touchdowns at the junior college level. Out of the 120 college teams in the Division I Football Bowl Subdivision, San Jose State was ranked 80th in points scored per game (24.5) last year. However, Shaw is still wary of his opponent’s quickness. The Spartans’ offense certainly faces a stiff test in Stanford’s formidable front seven. The Cardinal’s fearsome linebacker core is one of the best, if not the best in the country. Although inside linebacker Shayne Skov is serving a one-game suspension from his January DUI incident, sophomore James Vaughters—nicknamed by his teammates “Jugs,” short for “Juggernaut”—and outside linebackers Chase Thomas and Trent Murphy should give San Jose State plenty of nightmares. 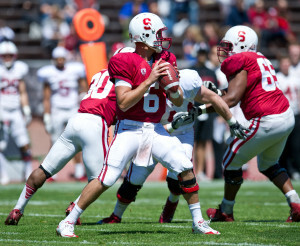 In what has been dubbed the “Bill Walsh Legacy Game,” Stanford and San Jose State have met 65 times dating back to 1900. Historically, Stanford is 50-14-1 in the series, and the Cardinal’s 57-3 blowout of the Spartans last season marked its eighth victory in the last nine years. The annual matchup honors legendary football coach Bill Walsh, a San Jose State graduate who served as Stanford football head coach before going on to win three Super Bowls with the San Francisco 49ers. Shaw took some time out of Sunday’s practice to address Walsh’s deep-rooted ties to each school, as well as the legacy that he left as a football coach and person. Staying on the attack is exactly what the Cardinal looks to do tonight. For the younger players—guys like Lee Ward and Patrick Skov at fullback and Ed Reynolds and Usua Amanam in the secondary—who are seeing significant playing time for the first time in their collegiate careers, it’s about how they respond to adversity. Still, based on what has been an intense preseason camp, Shaw is confident in knowing what to expect from most of his players. Shaw will find out about that last 10 percent tonight as the Cardinal kicks off its season against San Jose State at 7 p.m. at Stanford Stadium. The game will be broadcast live nationally on Pac-12 Networks. George Chen is a senior staff writer at The Stanford Daily who writes football, football and more football. Previously he worked at The Daily as the President and Editor in Chief, Executive Editor, Managing Editor of Sports, the football beat reporter and a sports desk editor. 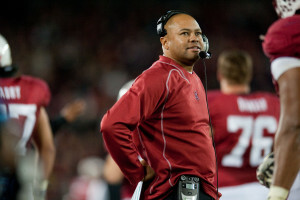 George also co-authored The Daily's recent book documenting the rise of Stanford football, "Rags to Roses." He is a senior from Painted Post, NY majoring in Biology. To contact him, please email at gchen15@stanford.edu.